It would be almost twenty years before we learned that wasn’t the case. This caused major confusion when the marketing for 2009’s Coraline billed it as “from the director of ‘The Nightmare Before Christmas.’” Everyone thought it was a Tim Burton movie – and when we found out no, it was by some dude named Henry Selick, there was a great wailing in the land such as had not been heard before or shall be again. Now, animation buffs and Burton aficionados knew this long ago. But for the majority of the viewing public this was a mindblowing moment. Further, those of us who sought the bottom of this directorial contradiction discovered that Nightmare was based on a three-page poem by Burton, a script that – while benefitting from his input – was not written by him, and that the celebrated uber-goth had spent, according to Selick, a total of about ten days on set over the course of the two year production. We can also credit him with the character designs – so that’s something. The point here is that while The Nightmare Before Christmas was definitely Burton’s baby, its growth into the film that we all love today was steered entirely by Henry Selick and his army of animators. Why was his name so absent from the marketing? Because Tim Burton is a brand we all recognize. Thus we have “Tim Burton’s The Nightmare Before Christmas,” as directed by Henry Selick over the course of seven hundred days and over 100,000 frames of animation. That’s not just Hollywood, folks. That’s a lesson in life. Anyway, this preamble has little to do with Coraline, Selick’s next major endeavor, in terms of story. But it is a tale that deserves to be told, since the marketing for this film so earnestly pushed the Nightmare connection. Once upon a time Selick’s name was not enough to sell a picture on its own. In the twenty-first century his product was proven but his name was still non grata. I can’t speak for the man but I imagine that was a little annoying. However, from the mind of Neil Gaiman and with the animated expertise of Henry Selick, we now have Coraline, a stop-motion work of beauty and horror, whose fluidity is leagues beyond all stop-motion work before it and whose atmosphere, story and characters are almost perfect. Unfortunately, the film misses an essential ingredient in its finale that robs it of true excellence – and I will get to that momentarily – but the movie is so good that it almost doesn’t matter. Transplanting Gaiman’s England-based story to the Pacific Northwest, Coraline is about its eponymous little girl moving to a big, decrepit boarding house filled with kooky characters and a mangy black cat. Her mother (Teri Hatcher) and father (John Hodgman) are writers for a gardening catalogue, both too busy to pay attention to their precocious daughter, giving her free reign to explore her drab new environment. She finds a small door in the wall of the living room. After asking her mother to open it, she’s disappointed to discover nothing but a wall of bricks on the other side. But that night a jumping mouse wakes her and leads her to the door, which now extends to a vibrant mirror house, complete with a doting “Other Mother” and “Other Father,” practically perfect in every way – except for the unsettling fact that they have buttons for eyes. Coraline was specifically written by Gaiman to harken back to traditional fairy tales, the stories of children getting everything they want in a magical land without realizing the high price they must pay to ignore reality. Other Mother’s goal is neither as sweet nor as harmless as her tasty treats, which Coraline will soon learn at the cost of everything she loves. Praise goes to the voice cast who all give terrific performances. Ian McShane is criminally underused (which seems to be traditional in everything he appears in except for great television shows that are prematurely cancelled) but the ladies under the stairs, young Wybie, and especially the great Keith David, all milk the lush animation for character voices that fit and stick with you. Teri Hatcher pulls double-duty as both Coraline’s true and Other mothers with alternating irritation and menace. Best of all, young Dakota Fanning makes Coraline a smart but petulant character that still manages to be sympathetic. Her Michigan-twang, as coached by Selick, is spot on, and gives her character a real sense of place. The film is magical, which is an easy and oft-repeated commendation for it. Claymation and stop-motion are not easy mediums but they capture the otherworldliness of this tale so much better than CGI could – which was the studio’s initial plan. Even before that there was talk of making it live action, which would have been interesting but nowhere near as interesting to watch as Selick’s masterpiece. It really is a feast for the eyes and Selick is very keen to make it so. The film is a triumph and spooky and a haunting success and all of those lovely things. Plenty has been written on its good points and I second them all. What is irksome, though, is how the film finishes. Not having read the book, I can’t compare, and so I lay this disappointment at the feet of the film – that disappointment being that its third act is a bit safe. More than safe, actually; it’s nowhere near as scary as its first and second acts promise it will be. I have no doubt Selick’s studio had its say on what they could allow in a children’s film and, yes, we can classify this as a children’s film. It’s a very good children’s film – that’s why people of all ages can enjoy it – but even Selick notes in his commentary that they struggled at the end to not make things too intense. Without spoiling too much Coraline is tasked by her Other Mother with finding three objects that will help her get back to the real world. From the get-go it has the feeling of a video game fetch-quest. This is unfair because finding specific objects on a journey is a trope that is far older than video games, claymation or Neil Gaiman; older even than Grimm’s fairy tales. That doesn’t change the fact that after Coraline finds each object all that’s missing is a little Ocarina of Time tune and a spinning star above her head. This feeling might have been diminished somewhat if the objects took actual effort to obtain, but despite action happening around her Coraline manages the quest easily. And while the things she faces are scary, it’s impossible to believe Selick and his team couldn’t have gone much further with the twistedness of the Other World. The secret core of Coraline’s Other World is a very dark thing indeed. The previous children snared by Other Mother reveal its horror in a way that may be unsettling for young viewers, but it never quite reaches beyond that. Claymation, more so than CG and even 2D animation, has the capacity to get very, very disturbing. It’s the way the figures move that does it, the strangeness inherent to the medium. Coraline is so mature in its tone and direction that it’s disappointing that it doesn’t pull out all the stops. It stifles an otherwise freewheeling adventure, but ultimately it cannot stifle its charm. 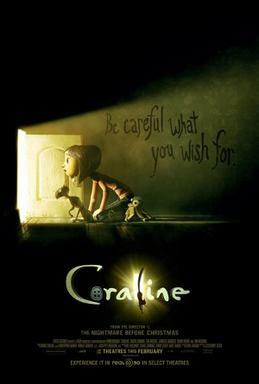 Coraline is an animated film that is beautiful, painstaking frame to painstaking frame. It’s at once heartening and disheartening that claymation takes so long to do. Selick and his crew have assembled a work of art that is smart, affectionate and scary, but such laborious productions mean that we will only get so many of these in a lifetime. That makes them very easy to treasure. Nice, Prince of Egypt reference! I hate to be this guy – but technically it’s an Old Testament reference. Exodus 11:6 FTW, bro!